The second version of the first “big box” Amiga, full of the new Zorro 2 expansion slots and a Video slot… It underwent it’s first major revision to this version of the hardware under Dave Haynie, which made it based on the Amiga 500 instead of the Amiga 1000 like the Amiga 2000-A was. This was and is commonly known as the B2000, as the internal code-name for the Amiga 500 was “B52 Rock Lobster”. Released in 1987, there were many revisions of this version, and production finished in 1991. 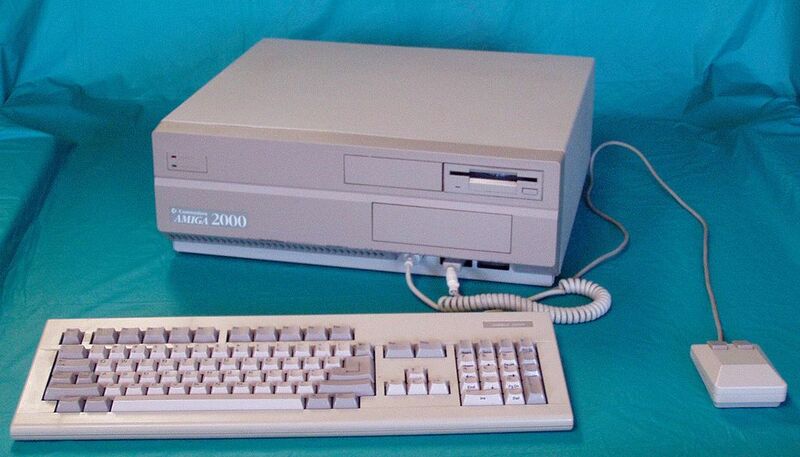 This was externally the same as the Amiga 2000-A, and also shared many of it’s internal features, such as Kickstart in ROM. This version, and all later revisions, were based upon the design of the Amiga 500 – for more information, please see the Amiga 2000-A page. This was the basis for many professional setups – particularly when paired with a “Video Toaster” Video expansion card, an accelerator card, and the Lightwave 3D Software. 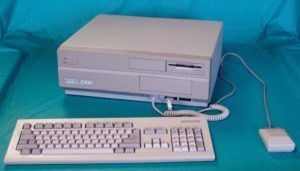 It was also the basis for several different Amiga models, such as the Amiga 1500 (UK variant, sold with 2 Double density floppy drives and no hard disk), the Amiga 2000HD (An Amiga 2000 with a A2091 SCSI card and SCSI Hard Drive, usually a 52MB drive) and the Amiga 2500 (An Amiga 2000 with either a A2620 CPU module to make the Amiga 2500/20, or a A2630 CPU module to make the Amiga 2500/30). Later revisions brought the ECS revision of the Agnus chip to the Amiga 2000, along with Kickstart 2.04 and Workbench 2.0.
as much as 9MB in several configurations, dependant on main board version.